The Patins and I wanted to meet. They wanted to figure out if I was the one to write Lori’s story. 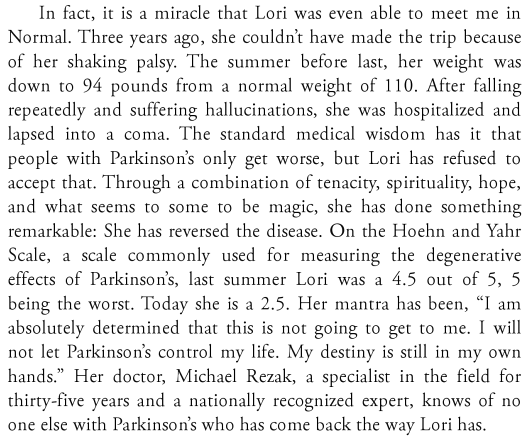 I knew I admired Lori’s struggle against Parkinson’s, but did I want to spend a year of my life writing about it? When we first met, Bob very wisely decided that we should not get together on either of our home turfs, but on neutral territory halfway in between St. Louis where I live and Chicago where they live. He calculated the distance between the two cities and divided it in half. The closest city to the halfway point was Normal, Illinois, home of Illinois State University. 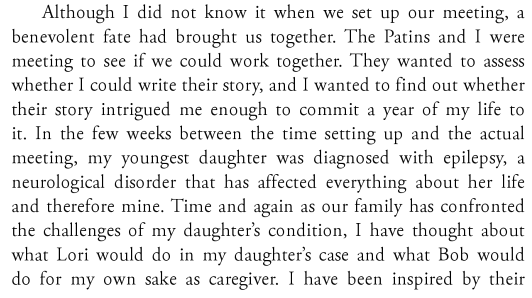 Between the time that we made the date in Normal and the day we arrived there, my daughter was diagnosed with epilepsy. I was still reeling from shock. A teacher had contacted us to tell us about staring spells, but then she had a full out grand mal seizure. What did this mean? Would she be safe? How did she live her life with this disease? How could I help her? She was at the worst possible age to receive a diagnosis of epilepsy. She wasn’t a child so that I could manage her care. She wasn’t an adult who would take a reasoned approach to managing it herself. She was a teenager, rebellious, pushing the limits. She kept saying, “I just want to be a normal kid.” Doing some of the things normal kids do is very, very dangerous for someone with her condition. And then I met Lori and Bob. How lovely she is. How much they care about each other. How much her struggle mirrors my daughter’s. How much Bob’s struggles mirror mine. It was fate that brought us together at this critical time. Like Lori, I can say from the bottom of my heart that I am a very lucky person within a very unlucky situation. Her story has enlightened my life.